People often ask me how I come up with my plots. It’s a great question and one that changes with each book I write. Some books come from reading a newspaper article. Some come from hearing a snippet of a story or memory. Still others come from reading books. But each time is a wee bit different. 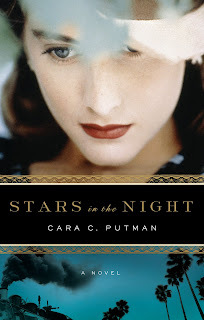 My latest novel is Stars in the Night, a story about Hollywood during the early days of US involvement in World War II. Glamour, glitz, and murder –what more could you ask for? Makes sense now, but at the time I was looking for a plot, I wasn’t quite sure where to start. I was working on the last book for my second World War II series for Heartsong Presents and beginning to think about where I might want to set a future series. My husband, who is as big a World War II fan as I am if not more, and I were brainstorming one night. Since I’d done two series set in the Midwest, I kind of wanted to branch out, and I’ve long had a love of classic movies. As Eric and I were talking, we hit on the idea of Hollywood during World War II. There were so many different roles that the stars played during the war. Canteens. USO tours. Active service. 4-Fed. The plot options and historical details seemed endless. Then as I researched I stumbled on the original Hollywood Victory Caravan. My imagination kicked into overdrive. What if I created a second Victory Caravan? What if a killer followed someone on to the train? What if people died and you were trapped on the train with a killer? And what if romance blossomed in the midst of the suspense? I got pretty pumped very quickly. Then I got a call from Susan Downs, the woman who became my editor at Summerside. She wondered if I might be interested in writing historical romantic suspense for them. And as God works, one of the settings they were interested in was Hollywood. It was perfect timing and a great fit. For Stars in the Night, the research lead to a story set in Hollywood in 1942. When attorney Audra Schaeffer's sister disappears, Audra flies to Hollywood to find her but instead must identify her body. Determined to bring the killer to justice, Audra takes a job with the second Hollywood Victory Caravan. Together with Robert Garfield and other stars, she crisscrosses the southern United States in a campaign to sell war bonds. When two other women are found dead on the train, Audra knows the deaths are tied to that of her sister. Could the killer be the man with whom she's falling in love? The only problem about all that research is that I have a dozen more plot ideas running through my mind for Hollywood during that era. So many ideas…so little time! People say I've accomplished a lot and that I must have life by the proverbial tail. Hardly! I grew up as a homeschooled kid when homeschoolers were misunderstood and oddities. Your personal story sounds as amazing as your novel :-) What a beautiful cover. You're already a major hero of mine because of all the wonderful encouragement you give through ACFW. I am so curious as to how you can have a career in law AND put out so many books in such a short time! What is your schedule like? When do you find the time to write?